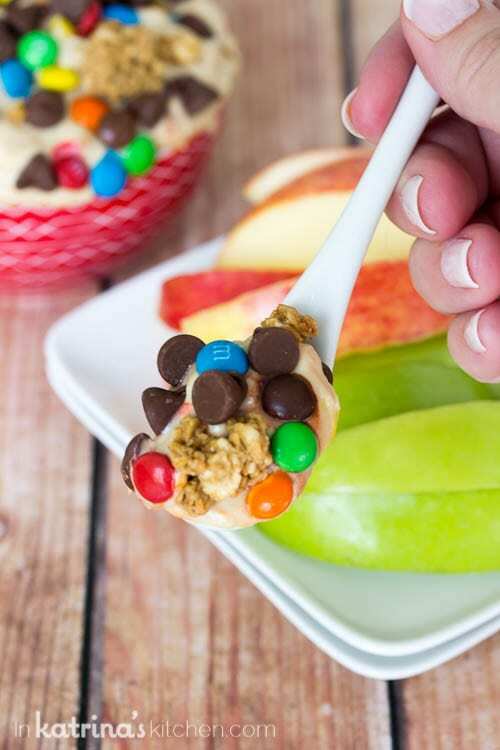 This Greek Yogurt Cookie Dough Dip is perfect for an afternoon snack or post-workout recovery treat. Our boys love it after soccer practice! 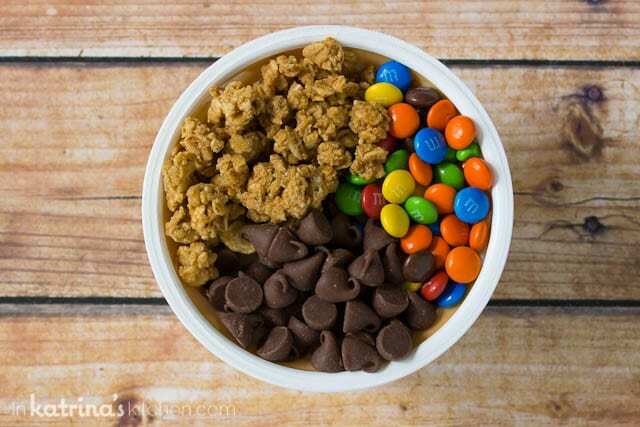 You can even mix it up carefully right in a yogurt container- no need to dirty another bowl. I’m sharing this recipe in connection with American Dairy Association Mideast. Need a quick treat without the guilt? 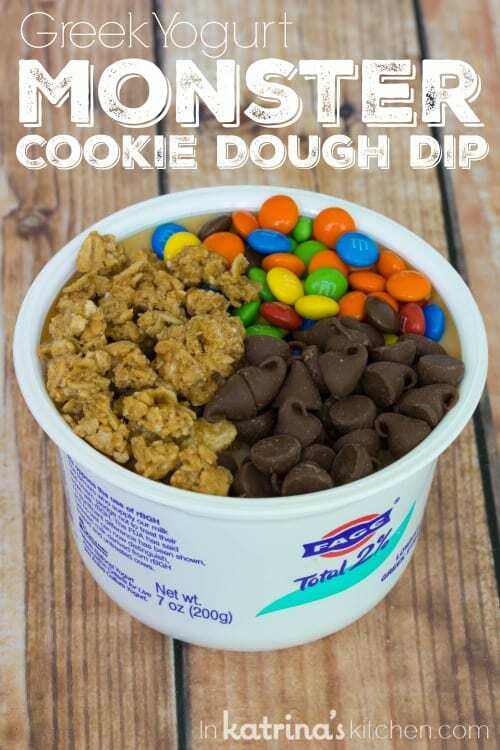 Mix up Greek Yogurt Monster Cookie Dough Dip for those times when you’re craving something sweet! Our boys enjoy this after school or after soccer practice. And, because it is packed with protein from Greek yogurt, it keeps them full until their next meal. The recipe is highly adaptable to your own liking by swapping out with your favorite sweetener, nut butter and mix-ins.Try it with almond butter or Biscoff cookie butter spread! Serve with graham crackers or juicy apple slices. Or just enjoy it with a spoon! Did you know that June is National Dairy Month? In Ohio and West Virginia, dairy farm families raise more than 276,000 dairy cows on about 2,500 dairy farms. In an average year, Ohio and West Virginia dairy cows produce approximately 5.5 billion pounds, or about 645 million gallons, of milk. Full-fat yogurt makes the creamiest, thickest dip; however, you can enjoy with nonfat or 2% as well. No adjustments to the recipe necessary! Find out the differences between Greek and regular yogurt. Using brown sugar (rather than honey or maple syrup) as the sweetener keeps the dip from thinning out, but feel free to use the sweetener of your choice. Also, brown sugar gives the dip a more distinct cookie dough taste. 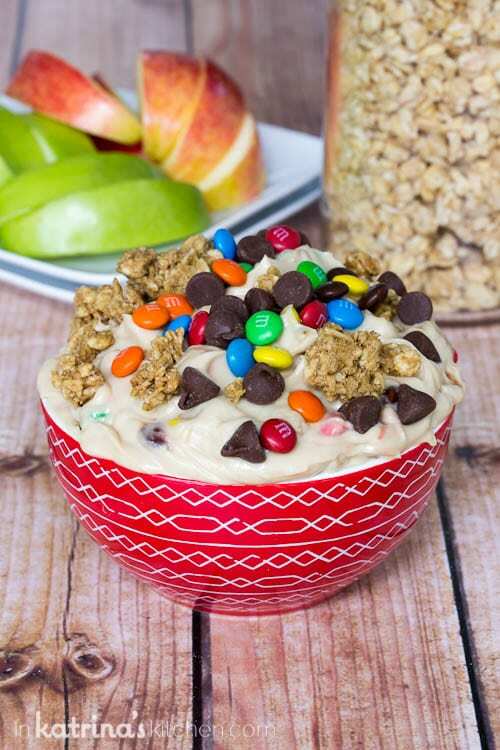 Greek Yogurt Monster Cookie Dough Dip is packed with protein! Use your favorite nut butter and sweetener. Top with your favorite mix-ins to enjoy this sweet treat! Stir together Greek yogurt, brown sugar, peanut butter, and vanilla. Stir in the mix-ins (chocolate chips, candies, and granola). 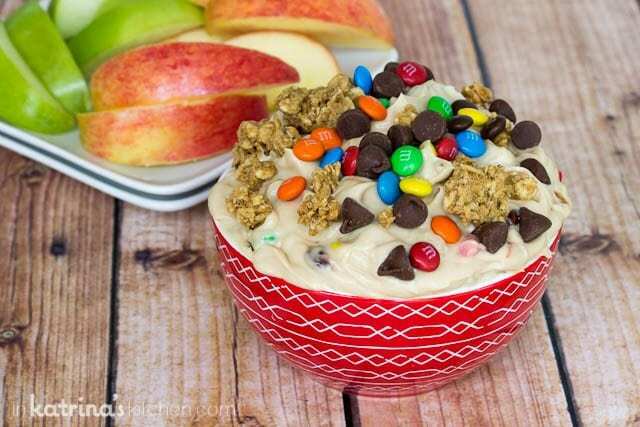 Serve with apple slices, pretzels, graham crackers or enjoy with a spoon! Full-fat yogurt makes the creamiest, thickest dip; however, you can enjoy with nonfat or 2% as well. No adjustments to the recipe necessary! Using brown sugar (rather than honey or maple syrup) as the sweetener keeps the dip from thinning out, but feel free to use the sweetener of your choice. LOVE that you used Greek yogurt here! Can’t wait to dig in! Oh my gosh! I can’t believe you made my favorite cookies into a HEALTHIER dip. SO excited to make this recipe! I absolutely LOVE that you used yogurt. I am totally doing this for a treat! Literally just about to make a snack before the gym – Now i would much rather have this lol. This looks sooooo good! I love that you used Greek yogurt! This looks fun and festive! love love love. Monster cookies are my life. I won’t be able to stop eating this! YUM!